Looking at our FeMail collage post cards, you too can become a labelographer. Studying the graphic design, logos, color and design of labels is Labelography. Using labels and packaging in collage is the quirky passion of FeMail. There are so many ways to look at a label. Having a background in graphic design, my eyes are fine-tuned to layout, choice of color and words. I know that there is a creative person behind every bit of packaging, because I was that person! Using everyday paper like packaging began to infiltrate my collage years ago when I was on an extended family trip to Switzerland, France and Italy. I challenged myself to use only the papers that I encountered each day as my palette for making a collage-a-day in my travel journal. It started with the sugar packets that I used in my cappuccino or café lattes in the coffee shops and cafés. Slowly but surely, it spread to using water bottle labels, ticket stubs and even receipts. Labelography fascinates us endlessly. Suzi’s scavenging knows no bounds. All she needs is a glue stick and she makes art from trash. She can be found rescuing gum wrappers or tea tags from the trash. Look closely at these cards and you will see what we both like to eat and drink. This Happy New Year greeting from ‘08 is made from Spangler Candy Cane cardboard packaging. It’s so very retro and cheery in red and green. It reminds me of my childhood. I can just taste the peppermint. There is something so POP art about using packaging in its original state. I find this irresistible. Image © Karen Arp-Sandel, All Rights Reserved. On the reverse is the candy foil from a Santa chocolate that I burnished onto a piece of vintage wrapping paper. 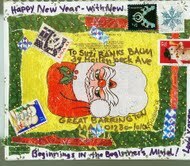 There is an assortment of recycled snowman postal stamps and a lovely 39-cent snowflake stamp for postage. 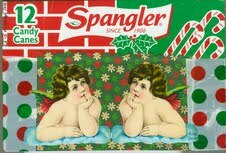 Spangler is a theme that turns up again in this 2010 Holiday post card to Suzi that hints at what a couple of angels we are with vintage die cut angels and very POP seasonal polka dot tape. For the Hand Made Holiday Fest at the Alchemy Initiative in Pittsfield, MA, last December, Suzi and I collaged one–of-kind holiday post cards for our FeMail Boutique. 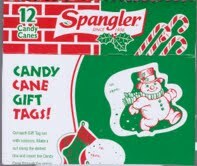 I used my favorite Spangler boxes for these festive FeMail postcards. For me ART is like FOOD for my SOUL. 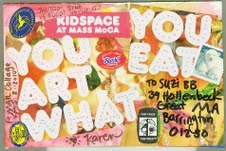 I couldn’t agree more with the theme of the exhibit at Mass MoCa’s Kidspace Gallery “You Art What You Eat” 2010, featuring artists who made art using packaging and food. Kindred spirits to me, they used some of my favorite materials to make their sculptures and pictorial works, such as candy wrappers and produce stickers. I used tiny produce stickers to embellish the backside of this missive including my favorite brand: “Susie”. This post card encapsulates the summertime with labels. Sing Tao Chinese beer labels are full of symbols and calligraphy in gold, red, green and blue. I imply a double entendre, exhorting the singing of the Tao or way of food with my cut and paste message on the front of the post card. I taught Pirate Art Camp that week, so I was inspired to include the Pirate’s Booty label. Peace and Love with Ben & Jerry’s ice cream cone wrapper brings the message of my wishes for the world while placing a collage cow deep in the plastic green grass from my sushi take out! It’s all To Rave About and I say so with a tape transfer. So now you know all about that July week’s eating though my labelography. My extrapolation of this quote I once read endorses me to just play and play, draw, photograph and collage something in order to know it better, to learn the mystery of its geometry. Whether it is chocolate wrappers or shapes seen on signs, in ironwork or paving, I take in what I see with an artist’s eye. You can read more about this on my website, but here in my FeMail, there are traces of this play all over my cards. Take beer labels for instance. As a full time Mom, I do not drink beer often, but when I do, I like to enjoy the moment, savor the bottle, the beer and the label. In this card I made after a Michigan trip, I share with Karen a beer called “Esser’s Best” made with ‘pure Wisconsin water’. Already, Karen knows I was: A. relaxing, B. in Wisconsin, and C. enjoying the beige and red label with her in mind. The label adds a vintage feel to this card, while a tag from my daughter’s clothing purchase urges us to ‘Look Amazing’. Taken out of context, or off the t-shirt, in this case, the tag becomes as prophetic as the tea tags we both love. Image © Suzi Banks Baum, All Rights Reserved. This card has vegetable and fruit stickers saved from the compost pile. Tea packaging engages me endlessly. The instructions on the back of tea pouches hold secret messages; this one tells me for a perfect cup “while humming, bring fresh water to a rolling boil”. Humming? I thought I was making a cup of tea. There is a wrapper from chocolate that Karen and I shared together out on my back porch, a fancy brand we’d received as a gift. The same packaging shows up in another card. The color and handwritten brand name catch my eye repeatedly. The fun of using food labels is the evocation of the moment they were eaten. 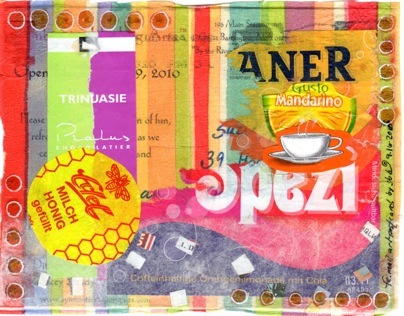 In the card below, full of summery colors, candy wrappers from Italy and Germany play against a brightly colored striped napkin I transferred to this card, and they recall the glorious play of summertime foods, treats and locations. How do you recall favorite foods? Some people save wine corks or labels they lay neatly in a scrapbook. My daughter saves wrappers to just glue in her journal pages in no particular order, as a memory. I let the labels on FeMail tell Karen what I am enjoying as I travel. Karen and I speak in images, whether we paint, collage or find them on our chocolates. We let this labelography in our FeMail dialect enrich our postcards with layers of meaning. FeMail Labelography requires a discerning eye, fine-tuned to the cultural similarities and differences in ubiquitous messages to the consumer. We like to look closely when unwrapping our foods as we prepare a meal. We approach this routine act as something special and elevate it to sacred, making it worthy of our time. It is so important to remember that as the beacons of Motherhood, we can nourish others and ourselves with the beauty of what we do. One of our favorite quotes from Rumi goes like this: Let the beauty we love be what we do, there are hundreds ways to kneel and kiss the ground. Rumi invites us to seek what we love and to walk that path with devotion. We hope you are enjoying this weekly exhibit of FeMail. Our cards are soul missives to each other, using materials everyone has at hand. There are hundreds of ways for you to kneel and kiss the ground! Bio: Suzi Banks Baum is an Heirloom Variety Mom living in the hills of western Massachusetts. She is a writer and artist, raising 2 teenagers with her husband. As she writes her book Laundry Line Divine: A Wild Soul Book for Women she blogs on the sacred in daily life at www.laundrylinedivine.com. 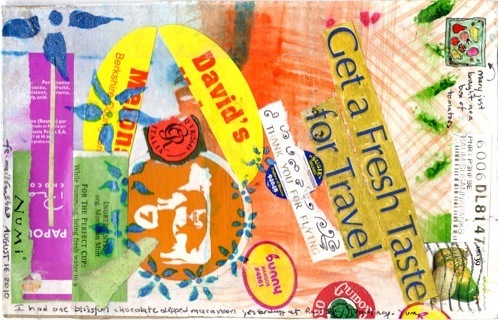 Visit an online gallery and discussion of my mail art collaboration with Karen Arp-Sandel titled “Fe-Mail” at www.femailart.com. Karen Arp-Sandel is a woman who wears many hats: artist, educator, yoga teacher, workshop presenter, Mother, wife, aunt, daughter and sister. In her role as a collage artist, she makes art in her home studio and teaches classes at IS183 Art School of the Berkshires, where she is on the faculty of the Painting, Drawing and Collage department. When she is not in her studio or instructing adults, she implements an exciting Learning through Arts programs in the public elementary schools using the skills in her “visual artist toolbox”. You can learn more about her in her professional capacity by visiting KarenArpSandel.com. 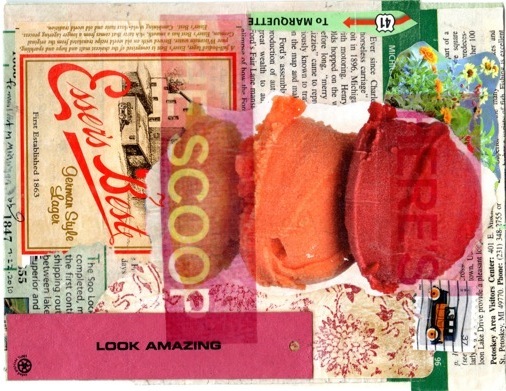 Come to FeMailArt.com to view an online gallery and discussion of the mail art collaboration between Karen Arp-Sandel and Suzi Banks Baum. You can also see more about this exhibit at MotherhoodMuseum.org. Images © Suzi Banks Baum and Karen Arp-Sandel; All Rights Reserved.